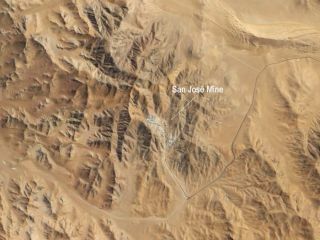 The San José mine lies north of Copiapó, Chile, in the world’s driest desert, the Atacama. The Advanced Land Imager (ALI) on NASA’s Earth Observing-1 (EO-1) captured this natural-color image of the mine and its surroundings Sept. 16, 2010. The mine complex appears as an uneven patch of gray in the midst of camel-colored hills devoid of vegetation. The 33 menrescued from a mine in Chile after a record 69 days stuck deep underground havereceived some cosmic praise from astronauts living on the International SpaceStation. "Fromouter space, we just wanted to let you know how proud we are of you, and howmuch we admire your courage and your tenacity," space station commanderDouglas Wheelock said Wednesday (Oct. 13) as the miners were lifted out of Chile's collapsed San Jose Mine. Wheelock, aNASA astronaut, is one of six astronauts living aboard the International SpaceStation. The crew includes three Americans and three Russians, all of whomexpect to spend around six months living in space. "Wewant to congratulate all the miners for their perseverance, and their faith intheir friends and their co-workers that were struggling so many days and somany nights to get them back to safety," Wheelock said. "Godspeedto everyone," Wheelock said. "It's truly an answer to prayer. You'vebeen in our thoughts these last several months and several weeks, andcongratulations." NASA senttwo medical doctors, a psychologist and an engineer to aid the rescue effort.The experts drew on NASA's experience with long-duration space station missionssuch as that of Wheelock and his crew to suggest ways to keep the miners healthy and in good mental health. NASAengineer Clint Cragg of the agency's Langley Research Center in Virginiaoffered advice on the design of the one-man rescue capsule used haul the minersout of their subterranean prison. "When Isaw the first miner being extracted I was both happy and very relieved,"Cragg said. Thereare still medical concerns forthe Chilean minersnow that they are back on the surface. After months living underground, theymay suffer from sunburned eye, fungal infections and post-traumatic stress,medical experts have said.